The decision to include Tampa Bay is a response to red tide. TAMPA BAY – The Florida Fish and Wildlife Conservation Commission has directed staff to expand a recent catch-and-release only measure for snook and redfish to include Tampa Bay. The area includes all of Pinellas, Hillsborough, Pasco and Manatee counties beginning Friday (Sept. 28). The FWC also directed staff to extend these measures through May 10 in these and other areas previously made catch-and-release for redfish and snook. Three-day forecasts by the USF-FWC Collaboration for the Prediction of Red Tides for Pinellas County predict variable currents with net southern movement of surface waters and southeastern transport of subsurface waters. Forecasts for Manatee to northern Monroe counties predict net southwestern movement of surface waters and southeastern transport of subsurface waters over the next three days. Forecasts for Northwest Florida predict net eastern transport of surface waters and northeastern movement of subsurface waters from Escambia to Gulf counties. 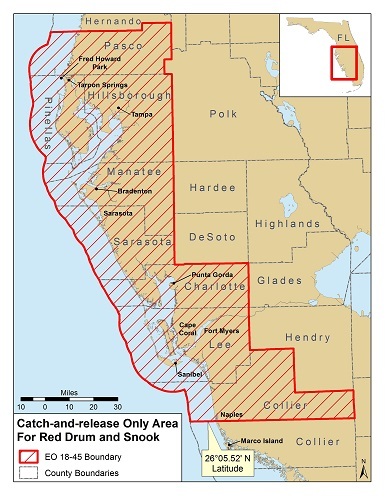 Map shows boundaries of catch-and-release restrictions for snook and red fish. For statewide updates about red tide, go to myfwc.com. Map courtesy of the Florida Fish and Wildlife Conservation Commission. Photo shows a snook swimming after lure in the ocean.